During the Globsec international conference in Bratislava, attended by Czech Foreign Minister Karel Schwarzenberg along with his counterparts of Visegrad Four (V4) countries, he announced that the foreign ministers disapproved of the enlargement of the association by the admission of Slovenia. Earlier, Czech President Milos Zeman declared his interest in Slovenia joining the Visegrad Four countries during his visit to Slovakia. 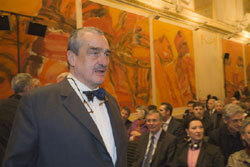 Schwarzenberg declared that the admission of a new member country would impair the productivity and competitiveness of V4. "We have discussed it and shared the opinion that it would not be efficient. We are cooperating very well exactly because we are such a small group. If it is enlarged, then a secretariat and some other institutions will possibly have to be established, which we do not want," Schwarzenberg said. He explained that in the last twenty years, several suggestions have been presented. However with the current operations, a new member would not be appropriate. "We (V4 countries) have our own interests that are very identical," Czech’s Foreign Minister noted. During the Globsec conference on foreign policy and security, Schwarzenberg and his counterparts from V4 discussed about the chance of deepening their cooperation, particularly in the energy sector. A declaration was signed by all Visegrad Four foreign ministers to support closer cooperations of EU member stats in common security and defence policy. The Visegrad countries were founded in February 1991 after the communist regime broke down with the intention of enhancing political and business relations between Czechoslovakia, Poland and Hungary. After Czechoslovakia’s split, the group turned into the Visegrad Four countries, which are part of the EU and NATO.